I'm so confused, can you help us figure out which package we want? It is difficult to decipher all the different package options for the Grand Canyon Railway. If you have a general idea of what you want to do, and know the class of service, simply put that in the comment section of your reservation and request that we match it to the closest package option. We'll contact you, usually within 24 hours, with the details of your train trip. You may change or cancel the reservation (72 hours or more prior to departure) if it is not what you had in mind. You MUST cancel directly with the train. If you want a rate quote, just leave the credit card information blank, we'll process the request and send you the cost of the tour. However, rates do change and often without notice, so don't assume the rate you were given last week will still apply next week. It may not. Can I get a military or AARP discount? Discounts are not offered for military or seniors. Does the train run year round? The train runs all year, except Christmas. Holidays, especially Easter, Thanksgiving and Independence Day sell out way in advance, usually at least two months ahead of time. The train runs regardless of weather -- rain, snow or shine. Most of the time, Coach or Budd Class will be available if the other classes are sold out. How soon should we reserve? If you want a General Round Trip on Coach Class, you can usually get it up to three days in advance of your departure. Other classes of service, particularly Deluxe Observation (Dome), First and Luxury sell out quickly and you should have a second option. Packages with hotel rooms sell out quickly. 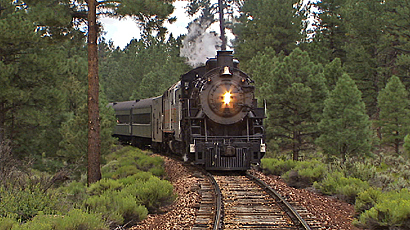 If you can't get a package with a hotel room, we recommend you book your own reservation in Williams and then arrange for a general round trip train tour. If you are flexible, you're likely to get something. If not, plan on reserving at least two weeks in advance. If you want a package with room nights in Williams, plan on reserving at least three weeks in advance. If your package includes an overnight at the Grand Canyon, we recommend making reservations a month in advance. This is just a guideline, the package may still be available three days or more prior to your trip. If you want a holiday weekend, we recommend as much lead time as possible. It is not unusual for peak travel times, such as Easter or Thanksgiving to be sold out months ahead of time. You can probably still get reservations, as long as you are flexible in the class of service you want. Because of the limited availability, we do not make reservations for the Santa Claus train. Which class of service should we take? I recommend opting for the best class of service you can afford. If you need to choose between an overnight at the Grand Canyon or a better class of service, I would take the upgrade in train classes. Another option is to split the classes of service. Take one way to the Canyon and another on the way back. If you have a limited budget, take Coach up to the Canyon and a better class return. Always take the better class of service on the return trip. A great way to see the Canyon is Deluxe Observation Class (Dome) to the Canyon and First Class on the return. Just indicate you want to split classes in the comment section. We're told our request isn't available. What are our options? You can make your own reservations for a room night and take the train up one day and back the next. Just indicate the itinerary you want in the comment section. If you would like us to check for substitute hotel rooms, there is a section on the reservation form to indicate this. If the Grand Canyon Railway Hotel (formerly the Fray Marcos hotel) in Williams is not available, we can substitute a hotel for you, and you can still have the meals if you have a Getaway. Or, you can make your own hotel reservations and do just a General Round Trip train ride. We already have reservations at one of the Lodges. Can we go up one day and come back the next? Yes, we can arrange a round trip over two days -- or more. Just put the dates in the comment section of your reservation form. Yes, we really do read what you write in there. Can we bring a bag (diaper bag, stroller, walker, etc.) with us on the train? There are overhead areas for storage on the train and you may bring a reasonable amount of carryon items with you. A very small cooler (tote) is acceptable. If you have a member with special needs, please fill out the comment section. Do we really need a ground tour, or can we explore on our own? No. The National Park Service shuttle picks up right across from the Depot and runs every 10 to 20 minutes. There are three shuttle routes which do not overlap, but do connect. The Village Route connects to the visitor center, lodging, restaurants, gift shops and campgrounds. The entire loop is about 60 minutes if you didn't exit the shuttle. It runs from 5:15 a.m. to 10 p.m. From 6:30 a.m. to 7:30 p.m. the shuttles run every 15 minutes. You need to take this into consideration when planning on your return to the Depot to allow for adequate time to board the train on your return to Williams. If you are late, the train will not wait for you. From the Village shuttle route, you can connect with the Hermits Rest route which is an additional 75 minutes roundtrip if you did not exit the bus. It runs from 9:30 a.m. to Sunset every 15 minutes. This shuttle stops at some of the better lookouts. The Kaibab Trail Route is 30 minutes roundtrip, with shuttles running from 6:30 a.m. to 5 p.m. about every 15 minutes. Handicapped Accessible shuttles are available with advance request to 928-638-0591. Is there any hiking involved? Not unless you want there to be. There are some exceptions, however. The El Tovar is not wheelchair accessible and there are quite a few stairs to climb to reach the top. Can we take a helicopter tour on our 3 hour layover at the Canyon? Yes, but this must be arranged with the helicopter tour company. Let us remind you that if you are late returning to the train, it will not wait for you and you will need to find your own transportation back to Williams. Are there bathrooms on the train and busses? All classes of service on the train have restrooms available. A member of our group is handicapped, can you accommodate us? What is the best class of service? The Grand Canyon Railway makes tremendous efforts to accommodate everyone. You just need to let us know the nature of your needs so that arrangements can be made. For instance, not all busses have wheelchair lifts, so if one is required, we need to know in advance. The new Budd class is designed to be wheelchair friendly. If you have limited mobility, you will be accommodated in any class of service (and there is storage for wheelchairs and walkers, etc.) We also get asked if you may bring a small cooler for medicines and supplies and this is certainly acceptable. Disabled passengers who are not wheelchair bound, but need assistance with transfers should bring someone along to assist with this. What will the weather be like? What should we wear? You'll need good, comfortable walking shoes, such as sneakers. We do not recommend sandals or high heels. In the summer months, a hat is recommended. It can get very cool at the Canyon even in the summer, so a sweater or windbreaker is recommended. From September through May, we recommend you anticipate bringing something warmer than you need in Williams, such as a jacket or sweater in September, October, April and May, and a coat in November, December, January, February and March. Dressing in layers will allow you to plan for the changing weather. It can and does snow at the Canyon as late as April and as early as October. How much are the park entrance fees? Can I get them waived with a park's pass? If you provide us with the number of your parks pass (you may need to present it, so you must have it with you), we will have the National Park Entrance fee waived. Otherwise, the park fee is about $8 per person, $16 for 2 adults, and $24 for three adults; and $25 for four. Most of the people working on the train trips earn minimum wage or less and depend on tips for their income. Food servers get tipped the standard amounts, bartenders $1 per drink, your car host $5 or $10 depending on the quality of service. The cowboy performers will rob the train and this is when you "tip" them (I give $5 or $10); and the strolling musicians ($5) are tipped after their performance. Tipping is not required, these are just general guidelines. I like to know in advance if tipping is expected so that I can have the correct bills with me. Did we miss your question? Send us email and we'll be delighted to help you.